Farmhouse Burlap Christmas Ornament made with items you likely have hiding around the house. Um, yes, please! I have a love of all things farmhouse, vintage, and rustic charm, especially rustic Christmas ornaments. Couple that with a love of homemade and frugal and I’m happier than our hogs in a mid-summer mud hole. If you’ve never watched hogs play in a swimming pool filled with mud, you’re missing out. I also kind of love watching Fixer Upper with Chip and Joanna Gaines because I mentioned the vintage farmhouse thing, right? And in true homesteader fashion, DIY is the way we role. As part of our Hand Made Christmas Challenge (click here and get yourself signed up pronto) I wanted to make some new Christmas ornaments using items I had on hand. 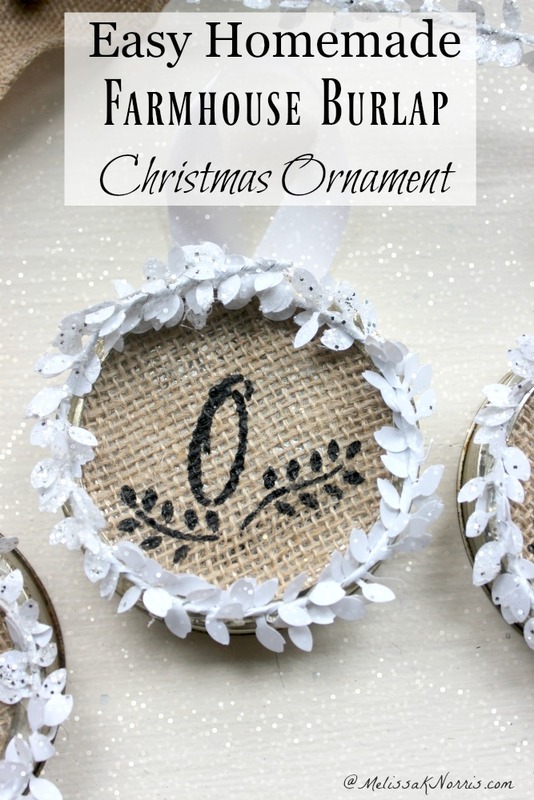 Because a homesteader always has canning lids, bands, and burlap on hand, these darling ornaments were born. You can watch our live tutorial here and some variations for your rustic burlap ornament making! Make sure to follow and like our Facebook page for weekly free training. Learn how to make more homemade items, over 100+ plus recipes and tutorials, including the Homespun Holiday’s Chapter in Hand Made: The Modern Guide to Made-from-Scratch Living, learn more here. Lay your canning lid on top of the burlap and cut out slightly larger than the canning lid. Hot glue the burlap to your canning lid, shiny side up. Center your stencil on the burlap and paint on the letter. Allow the paint to dry on the letter, about 30 to 45 minutes. Use leaf stencil or free hand your leaf pattern. Run a bead of hot glue on the inside of your canning ring and push burlap covered lid inside. Take your ribbon or garland embellishment and glue around outside of canning band to frame the ornament. Use ribbon or jute twine to create the hanger by making a loop (or try a bow) and glue it to the inner top of the canning band. Hang and admire your farmhouse Christmas ornament. You can create a word like I did, or use an initial for family members or friends. These make darling burlap Christmas tree decorations, but I’m thinking they’d be cute on a wreath or garland as well. 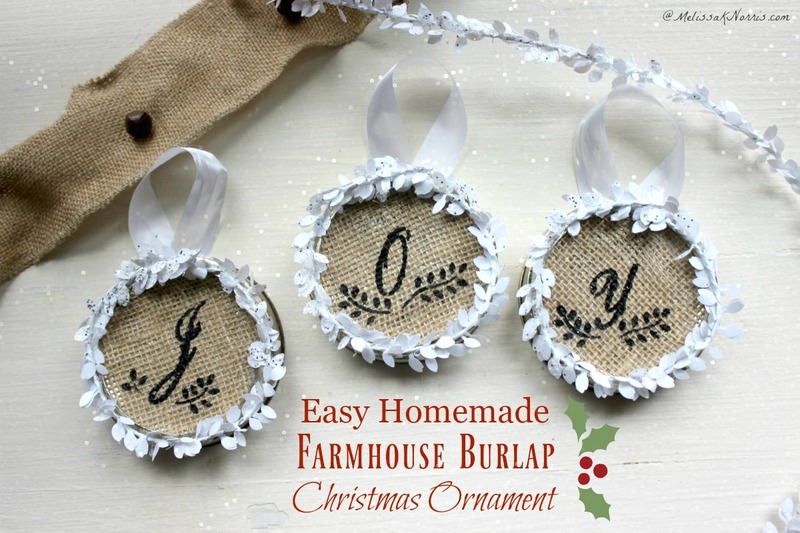 Are you planning on making a DIY Farmhouse Burlap Ornament now? I’d love to see it! Want more Hand Made Christmas fun? Make sure to sign up here for our FREE Hand Made Christmas Challenge and Series!